There’s no doubt that the mafia is a firmly established phenomenon in American culture. From thick, information-packed books about John Gotti, Lucky Luciano, and Bugsy Siegel to popular movies like The Godfather, Goodfellas, and everything that Robert DeNiro has ever been in, the mob still has a certain mystique in the eyes of the American public. Now, Turf Wars for the iPod Touch and iPhone lets you run your own criminal empire from the comfort of your safely garrisoned home, letting you enjoy all of the perks of the mafia lifestyle without the fear of being whacked by a guy named Paulie. Turf Wars is an interesting synthesis between the video game world and our own existence. 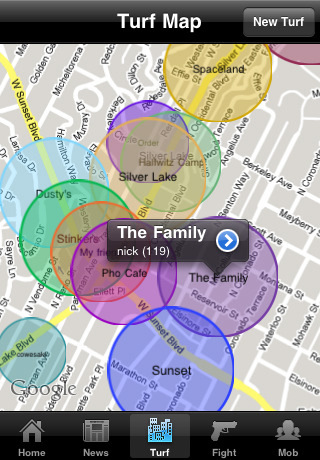 This app uses a standard GPS interface to offer interactions with various mafia cronies. All of the in-game locations are pulled from your real life neighborhood, and are represented on-screen as controllable turf. You can pick any local spot as the epicenter of your criminal organization–be it a grocery store or your grandmother’s house–and then invite nearby players to join your gang to defend and attack local establishments. Since you can also drive to another state and claim turf there, there’s really no limit to what can be yours. Turf Wars’ visuals aren’t as flashy as many other iPod games, but its clean, simple GPS interface is easy to slide into. Various buttons at the bottom of the screen give you access to the in-game functions, including a mission menu, turf list, your profile, a market that contains the tools needed for more profitable jobs, and a player finder to help you locate some close-by mob warfare. You gain levels, money, and weaponry during your various missions, though each has a certain aura of risk attached to it. Failing an important job will attract the attention of police and rival mobs, both of which will send your crew to the emergency room. Of course, the real attraction here is the creative use of Google Maps and the ability to manage your virtual mafia, both of which are handled well. Turf Wars is currently available as a free download, an offer that clearly can’t be refused.